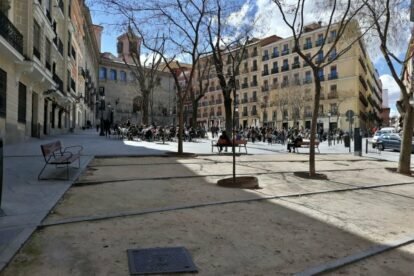 Plaza de la Paja is a large square in the La Latina neighbourhood of Madrid, which slopes down from Plaza de los Carros to Calle Segovia – I lived here for 6 happy years. It’s on the edge of the oldest part of town called “Madrid de las Austrias”, an area that includes La Plaza de la Villa, la Plaza del Oriente and la Plaza Mayor – the heart of the old city. Back in the 13th and 14th centuries, there was a lively market here, selling straw (paja) for the mules that drew the carts (carros) and hence the name. Great restaurants to choose from on the square include, Vida Burger (boasting arguably the best vegan burgers in Madrid) while Delic has wonderful cakes, cocktails and coffee. La Musa Latina has quite an eclectic choice of food that includes a fixed price lunch menu for 12 euros. Sitting outside is a good option; the trees make it a very pleasant place to be. Calle Redondilla (bottom of the square to the left) has maybe the oldest standing building in Madrid at Number 10 – it’s 15th century, but remains from the Bronze Age have been discovered in this area. Take a right from there onto Angosta de los Mancebos you’ll find yourself on Calle Bailen, with the Viaducto, the Royal Palace and the distant mountains to your right.